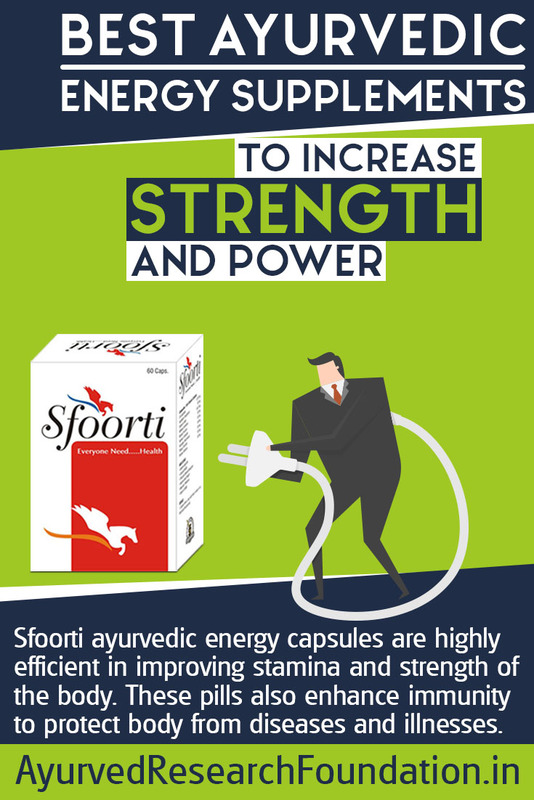 Sfoorti ayurvedic energy capsules are highly efficient in improving stamina and strength of the body. These pills also enhance immunity to protect body from diseases and illnesses. Sfoorti capsules are ayurvedic energy capsules designed to keep a person high on stamina by maintaining internal organs and systems in pristine health. With growing age and daily stress bodily systems and organs begin to slow down and malfunction, ayurvedic energy capsules possess herbs which maintain supplementation and enhance body’s process to produce higher energy to keep a person free from stress, lethargy, fatigue and stay high on stamina. Sfoorti capsules also protect organs from getting damaged by harmful substances like toxins and free-radicals and also enhance immune system functions to protect body from diseases and illnesses. Ayurvedic energy capsules rejuvenate entire health to enhance strength and stamina. The powerful herbs present in these pills are natural remedies for weaknesses which creep-up due to poor diet and lethargic lifestyle, and also handle health issues which slow down metabolism, circulatory system and weaken bodily organs and system. The herbs present in these ayurvedic energy capsules are rich sources of wide range of nutrients in bioavailable form which get absorbed in the body quickly and easily, and fill-in nutritional gaps and remove deficiencies. The herbal ingredients of these ayurvedic energy capsules promote even blood flow by removing blockages in blood vessels and supply nutrition to each and every cell and organ of the body. Energized, nourished and healthier organs promote stamina and strength and improve overall health considerably. Ayurvedic energy capsules eliminate toxins and supplement active and powerful antioxidants to curb free-radical mechanism, these harmful compounds damage tissues and cells and weaken health quickly, overall effects of Sfoorti capsules enhance cardio, circulatory, digestive and excretory systems of the body to improve health and keep blood purified. These ayurvedic energy capsules also supplement herbs which facilitate production of antibodies to fight back bacterial, viral and fungal infections. Sfoorti capsules are excellent ayurvedic capsules for stamina and strength which also improve mental health and provide relief from issues like anxiety, nervousness, insomnia and stress. These ayurvedic capsules for stamina and strength improve looks of a person by providing nutrition to skin and keeping skin cell generation higher. These herbal immunity booster capsules provide relief from skin conditions like acne, eczema, psoriasis etc. and remove lines, spots and wrinkles effectively. Sfoorti capsules possess wonderful herbs which suppress conditions like hypertension, diabetes, hormonal problems and enhance muscle mass, muscular endurance, bone density and control fat level. Sfoorti capsules also improve memory, mental alertness and maintain healthy senses to improve a person’s quality of life. Sfoorti capsules are combination of powerful herbs and are prepared under strict processes which maintain purity and quality of ingredients. These capsules are fit to be used even for prolonged duration and show no side effects in person of any age. These do not contradict with any on-going treatment and provide great results in a short time. 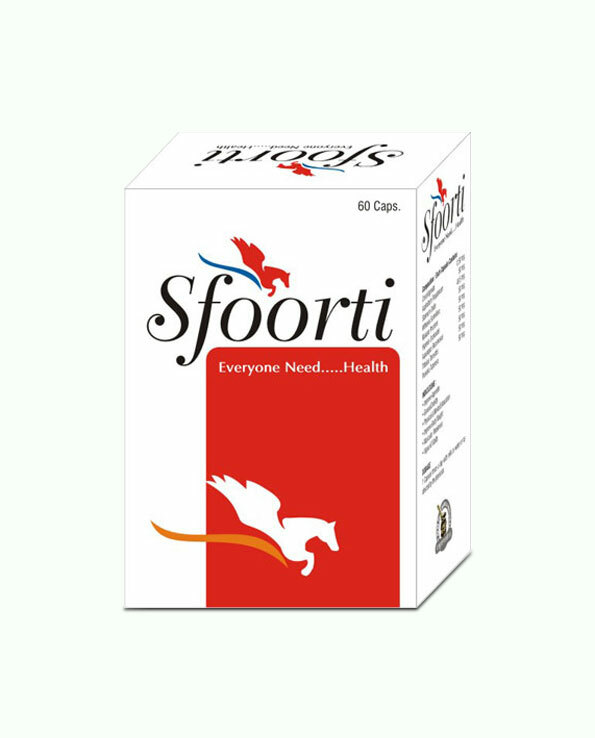 Sfoorti capsules possess wide range of highly beneficial herbs as ingredients which are – Shilajit, Ashwagandha, Safed Musli, Kavach beej, Kesar, Shatavari, Gokshuru and Kudzu. These herbs collectively not only improve vitality and energy of a person but also fertility and mental sharpness. These herbs elevate immune system functions and keep body disease-free. Higher immune system functions also help in healing injuries and repair damaged tissues to keep organ healthier. Using these ayurvedic supplements is very easy one can use them without disturbing his daily routine. Consume one or two pills of these with water or milk in morning and evening regularly after meals. Herbs cannot eradicate weaknesses and disorders overnight. It is recommended that one should use these for proper duration to gain all the benefits. Generally 4 months duration is sufficient but in cases where person is at later age or suffering with severe weaknesses these shall be used at least for 6 months. Anything which is nutritious, light on digestive system and fresh is recommended during course of treatment. Fruits, veggies, wholegrain, legumes, seeds and nuts shall form core of your regular diet for faster results. We provide easy options for you to make payments. You can pay us on delivery in India or you can drop us a cheque of DD, you can also deposit in our account directly. We accept payments through NEFT. We ship our products through FedEx and you will get the delivery within 3 to 5 working days. We value your privacy and deliver your order concealed in a discreet packing providing no details about its features or uses. I struggle with fatigue problem. I definitely will continue to use these supplements as they provided me with the extra energy needed to deal with this chronic disorder. Discreet Packaging and Quick Delivery of Product!! I’ve tried a lot of energy products but this one is the best of all. No side effect as it is prepared with 100% herbal ingredients. Highly recommended to all those who want to live a healthy life. I ordered this for my friend. This product is great for anyone who needs the energy and not the coffee. He uses it when he needs a little boost in energy to make it through his hectic days. Will order it again!! I suffer with fatigue problem so I require some energy supplement to complete my daily task. And this product had been a great help in boosting my energy level. I purchased these supplements for my wife. She can feel a difference in focus and stamina within six days. Great Product!! I bought Sfoorti ayurvedic energy capsules for my husband. These capsules are very effective since it supports his workout regimen. This is highly recommended supplement. I have been taking these capsules for couple of months and amazed with its results. It enhances strength and stamina level and improved my health. 5 stars to this! No side effects, I’m gonna continue with it. Thank you for this.